Stuffing. I know it’s most people’s favorite thing, but I don’t like it at all. AN UNSUITABLE JOB FOR A WOMAN by P.D. James, because I love P.D. James, and I like that she veered from her Adam Dalgliesh franchise to write about this unlikely amateur detective who ends up solving a complex crime. 3.Which Scooby Doo character are you most like? Bonus: How are you at solving mysteries? I guess I would have to say Velma Dinkley, because I want to believe I’m smart and I do read a lot. I’m not very good at solving mysteries, but my characters are. 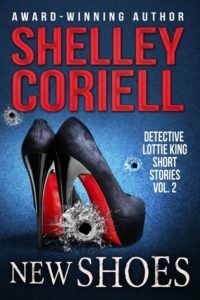 I am published in the crime fiction genre. Specifically, my three novels (SILENT CITY, FORGOTTEN CITY, and UNHOLY CITY) are police procedurals. Currently, I’m working on a thriller. Writing any novel is challenging, but I would have to say procedurals have special challenges. The plot has to be so tight. There are genre requirements that must be honored. Police procedures must be accurately portrayed, and you must give your readers a fighting chance to solve the mystery, but you also need to distract them with red herrings and give them a satisfying, unexpected ending. I’m not sure I would like to schlep speakers for anyone, but if I had to do it, I would probably want to do it for someone like Alison Krauss & Union Station or Bonnie Raitt. Definitely SILENT CITY. It’s the first book in the Claire Codella series. In this book, readers learn about Claire’s backstory as a cancer survivor and get to know how her relationship with Detective Brian Haggerty started. I would have to say I’m a discriminating shopper. I prefer quality over quantity. Dame Judi, definitely! She can make even a bad movie seem good. I just saw her in Murder on the Orient Express, and she can still deliver. I’d like to have Detectives Claire Codella, Eduardo Muñoz, and Brian Haggerty over for dinner anytime. They complement each other so well on the pages, I’d like to see them interact in real life. I would choose mind reading as my super power. As a writer, I would use that power to gain deeper insight into the motivations of characters. Start with what you know; enhance it with your imagination. Seinfeld. I live the muffin tops episode every day. To become a better writer, I read the works of other talented writers; write daily; and participate with a small group of trusted writers who critique each other’s fiction. Outside at the apple orchard—unless it’s really cold. I have wonderful memories of apple-picking when I was a child. 15. Name your favorite compliment you ever received from a reader or reviewer. After the publication of SILENT CITY, a cancer survivor who read the novel emailed me to say that I had authentically depicted her own experience. Rose had only joined St. Paul’s in the hopes of getting to know some nice men. Upper West Side Episcopalians, she’d assumed, wouldn’t be all that pious. She had envisioned a spiritual but not very religious group of liberal Democrats who pursued social justice by day and enjoyed their alcohol at night. That had sounded more her speed than Match.com. But so far, she had met no available men, and she was spending way too much time with bombastic vestry members who argued endlessly over stewardship, cemetery improvements, and whether to sell the church’s air rights. She walked down the parish house steps to head home but paused on the stone path that led to the sidewalk beyond the gate. St. Paul’s knew how to exploit individual talents for the collective good. While Rose hadn’t met the perfect widower in his forties, she had been appointed guardian of the church garden, and it, along with the soothing voices of the choir each Sunday, kept her coming back. She loved this modest plot of land more than any of the outdoor spaces she had designed for wealthy clients with private rooftops high above Manhattan. The little herb garden on the south side of the church could be seen and enjoyed by everyone in the neighborhood, and she had big plans for it. She decided to check on the bed of Moroccan mint she’d planted last month. She turned right and followed a path that ran along the limestone wall of the parish house. The Romanesque architecture reminded Rose of a medieval castle, and whenever she walked here alone, she sensed the confluence of past and present. The church archives said that two hundred years ago, this Manhattan Valley neighborhood had been a vast stretch of farmland known as Bloomingdale. Wealthy city dwellers from the southern tip of Manhattan had spent their summers on estates overlooking the Hudson River, and those estate owners had built and worshipped at St. Paul’s. Who, she wondered now, had tended her garden back then? Rose reached the southwest corner of the church and paused to breathe in the fragrant night air. Her Moroccan mint was thriving. She could smell it from here. She turned right again and followed the west wall of the building. The lights over the parish house entrance did not reach around this bend, but she knew her way and advanced confidently until her left foot caught under something on the path and her upper body catapulted forward. She instinctively raised her arms in front of her face and braced for bone-breaking impact, but she did not slam down on stone. Instead, her elbows thudded into something solid yet soft. A bag of dirt left by one of the volunteer gardeners was her first thought. UNHOLY CITY, a Claire Codella Mystery and a Nov. 7, 2017, release from Crooked Lane Books, may be purchased through these retailers: Amazon, Indie Bound and Barnes & Noble. 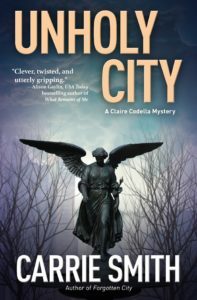 Carrie Smith is the author of UNHOLY CITY, the latest Detective Claire Codella mystery from Crooked Lane Books. Her previous books are SILENT CITY, FORGOTTEN CITY, and the literary novel, FORGET HARRY. 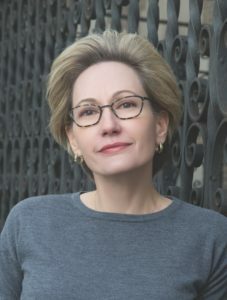 She is the recipient of three Hopwood Awards from the University of Michigan, a fellowship at the Fine Arts Work Center in Provincetown, and Killer Nashville’s Readers’ Choice Award. Carrie is also senior vice president and publisher of Benchmark Education Company, a literacy publisher. She lives on the Upper West Side of Manhattan. You can find her online through her website, www.carriesmith.nyc, and on Facebook and Twitter. If there’s one thing I enjoy almost as much as writing books, it’s READING books. I love discovering new authors, too. 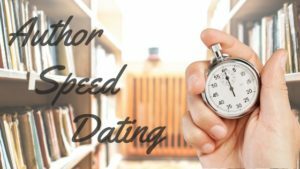 So as I planned my new blog, I decided this could be a perfect place to introduce my writer friends to new readers and introduce my reader friends to some of their new favorite authors. Only we’re going to do this Speed-Dating style. Just 15 getting-to-you questions, a little bit about the author and an excerpt from one of her stories. Check them out right here each Wednesday, and if the spark is there, you’ll have a match…or two…or three. Which Disney princess (or prince) do you wish you were more like? Cinderella, because I’ve never had glass slippers. Mine were cowboy boots. And which one are you really most like? Was the old woman who lived in a shoe a princess? If not, she should have been because – you know . . . kids! Monopoly – because . . . money, money, money! Four published and more than one unfinished hiding in boxes somewhere. Mama’s pecan pie — because . . . Texas! Nikes! I’d be a train wreck in heels. Conquered Hearts – unpublished rough and tumble western historical. Texas Longhorns and cattle drive. Yeehaw! My hardcover edition with three Nora Roberts’ “Born In” books because — you know . . .Ireland! Contemporary Romance and Cozy Mysteries. Fourth grade. I loved reading fairy tales and playing make-believe. Don’t procrastinate. Write every day even if it’s only a few lines. Neither one. How about Fixer-Upper? Hands down – Buddy Lee from ALL THAT MATTERS. Being sprayed by a skunk! For Contemporary Romance readers: ALL THAT MATTERS, an emotional Cinderella-in-reverse love story, deep in the heart of Texas. Cozy Mystery readers: BRINGING IN THE THIEVES for a taste of Texas twang and gospel music when a preacher’s daughter and an ex-con uncover some mighty dirty laundry among Ruby Springs’ holier-than-thou citizens. I knew the minute I read the church bulletin that I was fixin’ to be Southern-fried and plated up in front of God, the Faith Community Church deacons, and eventually the entire community of Ruby Springs, Texas, sure as my name’s Frankie Lou Birmingham McMasters. My well-meaning landlady, Nettie Bloom, had decided to announce my proposed church project without asking me if I wanted her to. I had just scheduled a meeting with the deacons about it, not given them any details about the idea. I hadn’t spoken it aloud to anyone but Miss Nettie. But now there it was in print, along with Miss Nettie’s usual assortment of misplaced phrases and Mrs. Malaprop word choices. Miss Nettie had been editing the church’s newsletter, News From The Pews, for a good many years, but I’d noticed her memory getting a little tangled lately. As we wait for the selection of a full-time pastor, we welcome back interim minister, Reverend Matthew Whitlaw to the pulpit next Sunday at Faith Community. His morning sermon will be “Jesus Walks on Water” followed by “Searching for Jesus” in the evening. Members of the Weight Watchers group will meet Monday at 5:30 for weekly weigh-in. Please use large double door at the side entrance to the annex. The Low Self-Esteem Support Group will be using the back door. Prior to prayer meeting Wednesday evening, a bean supper will be held in the church hall. Special music will follow. Until further notice, please give massages to secretary, Lovey Muchmore. She will then give massages to the newsletter editor who will share the details in the newsletter. SPECIAL ANNOUNCEMENT: A NEW CHOIR FOR TEEN SINNERS IS BEING FORMED AND WILL COMPETE IN THE SLUMBER FUN AT THE CITY PARK NEXT MONTH. For more information on sinning contact Frankie Lou McMasters at Doc Adderly’s Animal Clinic. Truth be know, there were certain people who weren’t exactly thrilled by my return to the town where my daddy, Reverend Frank Birmingham, occupied the pulpit at Faith Community Church before his retirement to Florida. I’d been gone from Ruby Springs eleven years, but it seems those certain people have the combined memory of a herd of elephants. 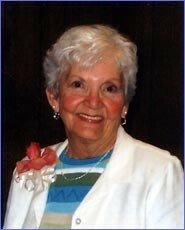 One in particular: Poppy Rose0 deHaven Fremont, Faith Community’s choir director. I grabbed my tote, made a quick call next door to Miss Nettie’s house where my eleven-year-old, Betsy, was staying for dinner, then headed for the church. It was a hot spring night and bound to get hotter. Help me, Lord, Miss Nettie and that newsletter are gonna get me killed one way or another. 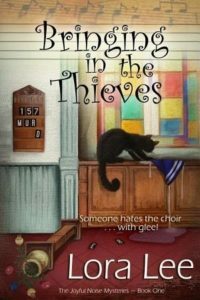 BRINGING IN THE THIEVES, Book #1 of the Joyful Noise Mysteries series, is published by Bell Bridge Books and available now in digital and print versions. Book #2 in the series is a work in progress – tentative title SWING LOW, SWEET LARIAT. Born in a small town in the Texas Hill Country, Lora Lee discovered the magic of reading at an early age and began inventing stories before she could write down the words. Her preacher daddy, as well as her mama, encouraged her love of books by making certain she always had a library card each time they moved to a new town. She currently resides in West Michigan. Known to her supportive critique group as LL or Tex, author Lora Lee is Mom to her four children and Grandma to her nine grandchildren and six great-grandchildren. She enjoys exuberant family gatherings when all twenty-plus members join her for good food and noisy ball games in the back yard. Keep in tune with the Joyful Noise at: Website, Twitter, Facebook, Google+, Goodreads. Lora Lee also writes as Loralee Lillibridge. Learn more about her contemporary romances through her blog and on her Loralee Lillibridge website.